1. Biotoxins bind to toll receptors, mostly in fat cells and cells that line blood vessels. 2. Cytokines (proteins) result. Cytokines are involved in immune and inflammatory response. They also recruit additional cytokines as they recognize the invaders. 3. Note: biotoxins that are not killed constantly signal the production of more cytokines thereby making biotoxins the source of illness. It is excessive cytokines that make a person sick This produces flu like symptoms, body aches, headaches, congestion, and much more. Some folks end up disabled by many conditions as a result of these excessive cytokines. 1. VEGF (vascular endothelial growth factor) can be reduce causing reduced blood flow and fatigue. 2. Hypoperfusion can result in reduced blood flow which starves of nutrients and oxygen. 4. Increase cytokines may also cause autoimmunity. 5. Three antibodies are observed in biotoxin illness. Myelin anti-bodies (protective sheath around nerve cells). 6. C-3 a and C 4a (reflect activation of competent system) increase. Note: C4a( mold patients) that increases upon reintroduction to home, indicates that the home has not been successfully remediated. 7. An increase in Leptin(made by fat cells) regulates storage of fat thereby possibility of making a patient fat. MSH (Alpha melanocyte stimulating hormone) decreases combine with increase leptin can make weight lost difficult. Note: MSH’s most potent anti-inflammatory compound in the body. Low MSH levels mean high levels of inflammation. MSH is responsible for regulating immune response; involved in many pathways. MSH is involved in production of melatonin and endorphins. Lack of endorphins results in increased perception of pain. Lowered MSH can result in cortisol and ACTH(andrenocorticotropic hormone) fluctuations will produce many of symptoms of biotoxin illness. Using these markers help doctors to treat mold patients and Lyme patients. This is the basis of the Shoemaker model for treatment. Understanding the biotoxin pathway is important in understanding mold illness. Basement Dehumidifier – 55 Pint – Low Temp – by WoodsDehumidifiers for home and office with operation down to 50°F. 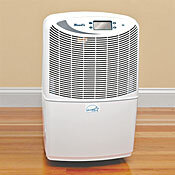 Dehumidifier covers up to a 1100 sq. ft. room, removes 55 pints of water per day. EPA energy star certified.